Crash Bandicoot first appeared during the 90s' and was originally only available for PlayStation. However, the saga has also landed on iPhone and iPad with titles like Crash Bandicoot Nitro Kart 3D, a racing game similar to Super Mario Kart, in which we'll take part in really extravagant competitions. In this game you'll drive around 12 different tracks located in different environments, making the game even more entertaining. Furthermore, you'll also be able to make use of a wide range of weapons to use against your rivals to try to prevent them from reaching the finish line before you do. To control your car, you'll only have to tilt your phone left or right, depending on the direction in which you need to turn. Super Mario Kart, Wacky Wheels and SuperTuxKart are in for some competition. You can play an online multiplayer mode to face your friends, as well as a story mode that allows you to play solo. 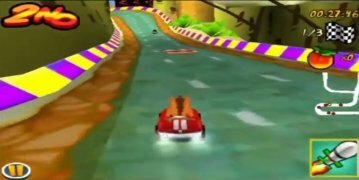 Why doesn't Crash Bandicoot Nitro Kart 3D receive updates? Well, we'd have to ask Activision, but just like the majority of video game developers for PC and video console, they probably prefer to spend their time and money games that generate greater income as is the case of the future Crash Bandicoot N. Sane Trilogy that will come out for PS4 in 2017. All fans are eagerly awaiting the moment.